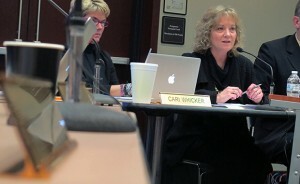 State superintendent Glenda Ritz chairs a previous meeting of the State Board of Education. The State Board of Education held a special meeting today to hear the Indiana Department of Education’s plan to keep its No Child Left Behind waiver. A few board members, including Dan Elsener, criticized state superintendent Glenda Ritz, saying she didn’t properly inform them of the problems Indiana was having meeting the federal requirements linked to the waiver. Chalkbeat Indiana‘s Scott Elliott reports on some of the initial concerns of board members toward Ritz. Why, they asked, did the U.S. Department of Education give Indiana 60 days to answer a series of concerns or potentially face sanctions? And why didn’t board members know sooner that this could happen? But Ritz insisted her team had not dropped the ball and would meet the requirements of the letter from Deb Delisle, assistant U.S. secretary of education, which said Indiana could lose a waiver that freed it from some potentially costly and cumbersome rules of the federal 2002 No Child Left Behind law. As we’ve reported, a group from the U.S. Department of Education visited the state last year to make sure it was doing what it said it would after being exempt from the benchmarks of No Child Left Behind. And last August, we weren’t. At the time, Indiana had just started to implement the Common Core into classrooms and had recently launched a program to monitor D and F schools. But those things were new and couldn’t be measured, so they were rated as “not meeting expectations” in the report. This is why Ritz and other members of the state Department of Education believe Indiana will prove it is meeting the expectations to keep the waiver. Teresa Brown, Assistant Superintendent of Outreach for the state Board of Education, explains the new monitoring program that is finishing its first year. The state’s recently passed academic standards that will replace the Common Core are deemed by many experts as on par with the federal government’s idea of “college and career ready,” and these, in addition to the new monitoring, program will address two of the biggest concerns outlined in the U.S. Department of Education’s report. The state must meet a June 30 deadline to prove they are meeting the federal requirements.